Austin Bluebird. I never get tired of looking at pictures of this quilt – I love everything about it. If you haven’t seen it, this is Laurie Simpson’s first Block-of-the-Month quilt. It’s made using several Minick & Simpson fabrics, many of which were re-printed so this quilt could be offered as Block-of-the-Month kits through shops. I really wanted to sign up… I even bought the pattern… but I know my history. The only thing I’m good about is keeping all the kits together. Do you participate in Block-of-the-Month programs? I love them and wish I were better about keeping up. I tried to count how many BOMs I’ve done – with “done” meaning “purchased the kits for” – and I think it’s nine. I have two that are for the same pattern, just from different shops. I loved what both shops had done and I couldn’t decide which one I liked best so… I haven’t finished either one. I’m not currently enrolled in one but I am making want to make the blocks for the Snapshots quilt. I’m told that one of the tricks to staying current is to cut the block out as soon as it arrives – within a day. Make it a priority. If the cutting is done, getting the block pieced seems less daunting. It’s the easy part – the most enjoyable part. I did get Block 1 cut out but that’s as far as I’ve gotten. I’d better get busy because Block 2 is coming soon. Do you have any tips for me? Or am I hopeless cause when it comes to keeping up? While you think on that, I’ll get back to Austin Bluebird. I’ll admit to having a little bit of bias regarding the wonderfulness of the quilt because I like Laurie and her sister, Polly. We went to the Infinite Variety – Red & White – Quilt Show in New York City together and while I can’t recall how it started or what Polly said, I remember standing on a street corner trying not to fall over because I was laughing so hard. People who meet them always think that Laurie is very shy and reserved, and I suppose that’s true. But that isn’t the whole story, the girl has a wickedly dry sense of humor. I think her quilts show that… that and an independent spirit, she does it the way she wants to do it so that it looks the way she wants it to look. 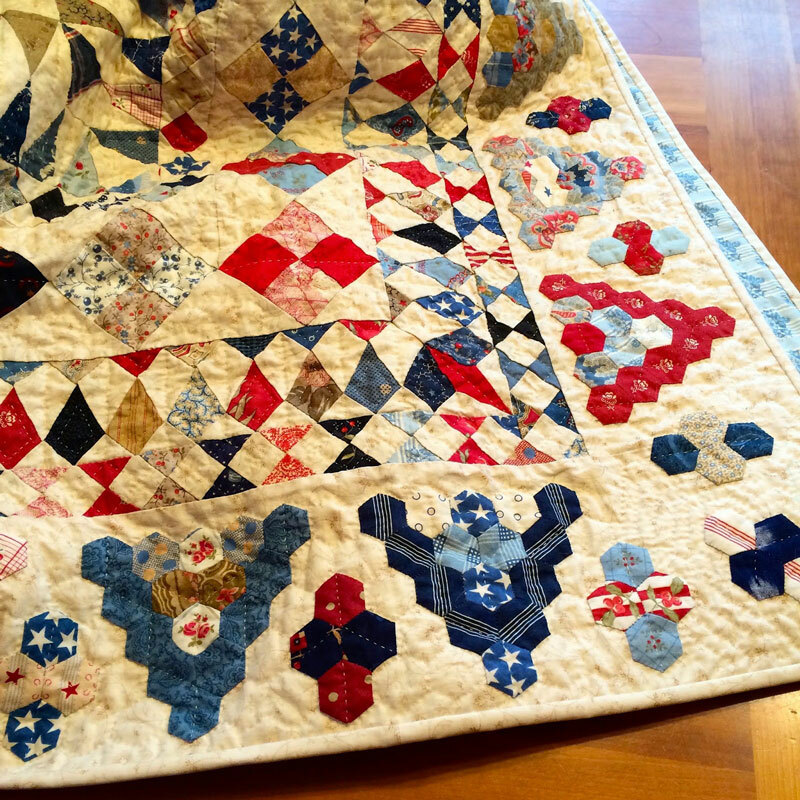 When you started making this quilt, did you envision doing it as a block-of-the-month pattern? Yes I did. We’ve had requests for several years to do one and I finally decided to do one. 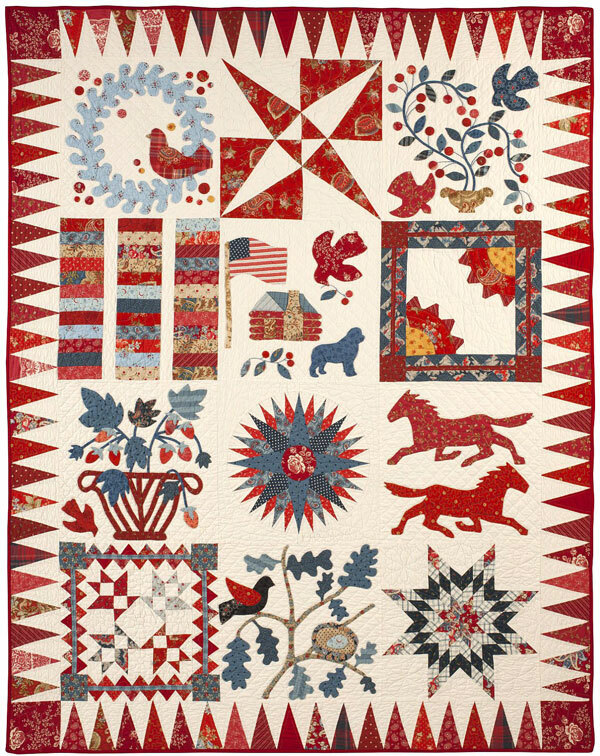 I’ve always admired 19th-Century sampler-style quilts that were all willy-nilly and quirky. With this thought in mind, I spied the drawings for the Moda Modern Building Blocks quilt on Lissa Alexander’s desk. That quilt looked so great with all the different-sized blocks that I decided I wanted to do mine the same way – no sashing and each block a different size. Though mine would have to have lots of appliqué. Looking back over the entire process, was there anything you would have done differently? Nope. While I designed it on paper and made the quilt from my sketches, it was the inspired construction devised by our graphic designer, Lisa Christensen, that makes this quilt something special. 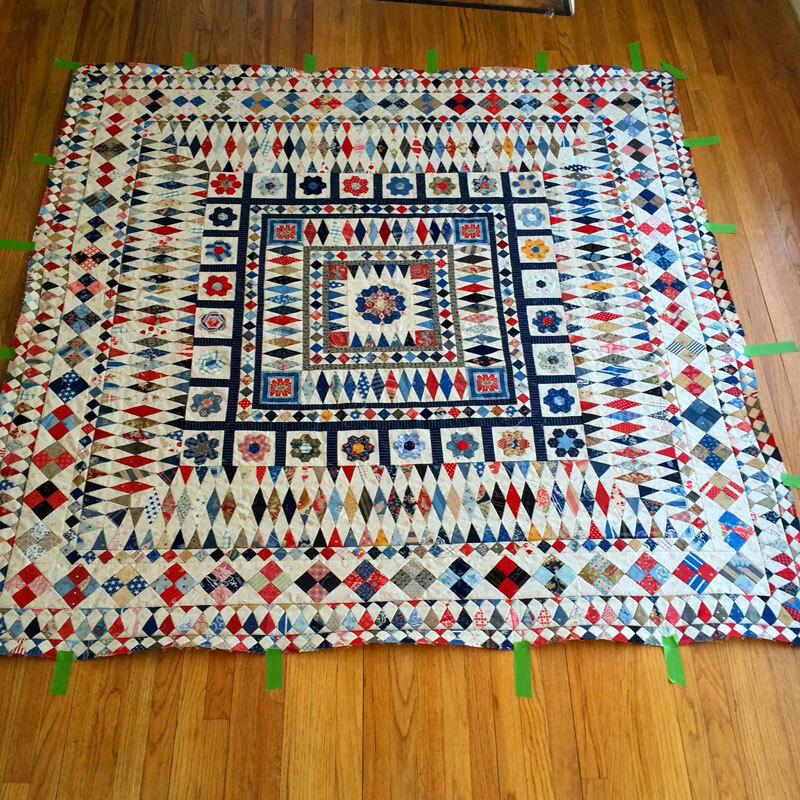 The month-by-month breakdown of the construction was her idea entirely and I think it’s brilliant that your quilt top is finished after Month 12. It’s quite the morale booster to realize that once your blocks are done, the top is done too. There isn’t a stack of blocks waiting to be put together. We were lucky to have her creative input. And… will you ever do another? (Please say “yes”.) Yes. Even though I don’t have any ideas drawn up, the response has been great and I had fun designing this one. 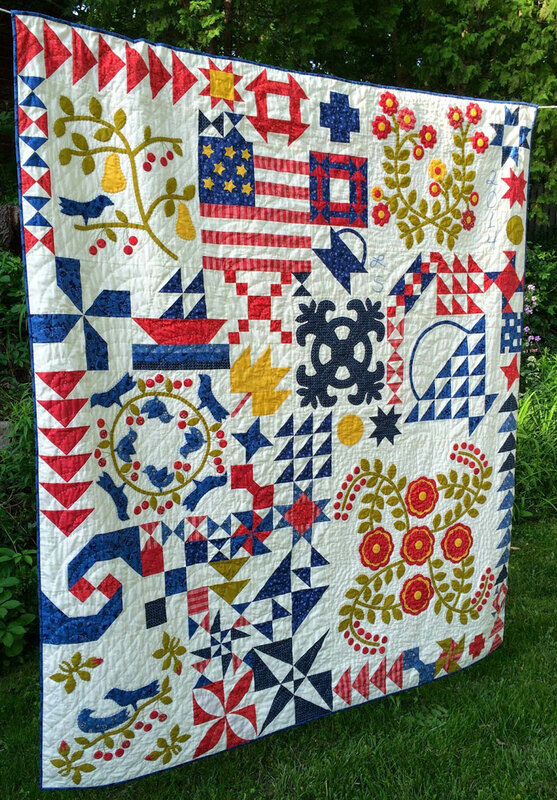 Last year, you made the spectacular English Paper-Pieced Mrs. Billings Coverlet quilt using Minick & Simpson fabric. It’s entirely hand-pieced, and then you hand-quilted it. What is it about handwork – hand-appliqué, hand-piecing and hand-quilting – that appeals to you? I jokingly tell people who ask about it – that it’s cheaper than a psychiatrist. Maybe it’s not such a joke. I have always loved handwork. I escape into it. I find it so relaxing to spend the evenings working on a hand-stitched project – all the while engrossed by a ballgame or murder mystery on television. What’s the best part about the quilt business? Easy – the people. It’s an unusual little sorority that we have in this business – with a few enlightened men. I’ve made great friends. Don’t worry – I won’t ask you what the worst part is. Instead, is there something you wish you could change about it? I had to think hard about this question to find something that needs changing. I’m still thinking…..
What is the one thing you wish you knew about the business before you started? I wish I were a little bit more computer savvy, and that I knew about photography. But it seems I can only wear so many hats. What is the one thing you’re glad you didn’t know about the business before you started? (That might be the same question.) Yes, it sort of is the same question. If I thought I had to know all the things that I’ve picked up and had to learn along the way I might have been too intimidated to even begin. Who knew that this path would lead to being a designer, author, business owner, accountant, and chief cook and bottle washer? My favorite Vulcan Mind-Meld question… Name one person in the industry whose mind you’d like to read, whose brain you’d like to pick. Why? What is it that they do that you’d like to understand? Wow, that’s a good question. Polly and I have had this conversation a lot. There are so many people who have amazing talent that we admire. But if I had to pick one, it would be Kaffe Fassett. We had the good fortune to spend some time with him when we did the Pour Amour du Fil show in Nantes, France. His genius with color is obvious and when he talks about his process and obsession with textiles – it’s just so inspiring. I hesitate to throw the label “genius” around, but he is deserving of the title. Now you know why I like Laurie. I’ll let you know how it goes with my Block 1. I am so glad to not be the only person who is fascinated by BOMs, yet struggles with keeping up! I find myself endlessly attracted to certain BOM projects, the Austin Bluebird is one of them (So Beautiful) – but between work, home, pets, mother, quilting clients, online quilting groups – I seem to have more ambition and enthusiasm than I have hours in the day (or week, or month, or year….). Sigh. But glad I’m not the only one. LOL. I think finding a buddy to hold you accountable is a big help. Maybe you could tell all of us when the block arrives, and then you’ll be motivated to show us the finished block to motivate US. I did a block of the month with a friend that lives across the country, and lo and behold, finished the block each month. Don’t ask I’d it’s put together yet, that’s a conversation for another blog post. Good luck. I’m really enjoying your foray into your new job, and read each post and root for you. I do at least one BOM a year – this year I’m doing the Craftsy, Building Blocks and FQS Snapshots! It forces me out of my comfort zone, if only for a month. I agree that the best thing is to do the block asap – once you’re 4 months behind, it’s too daunting to try to catch up! I’m relatively new to quilting and I am doing 2 BOM programs. The first one is C is For Christmas from Shabby Fabrics which started in November. It has embroidery in it too and I do that immediately when I get it. It has hourglass blocks in it too. I just watched the tutorial for that yesterday and sewed the hourglass blocks for the first block. Today I will finish them for the other 3 blocks. In January I started Christmas Keepsakes which is also from Shabby Fabrics. It’s fusible applique which I have ironed on the fabric and just need to stitch around it. I enjoy doing the BOM programs because it keeps me on track to get it done during that month. I have always loved every one of her quilts. I could look at them for hours and continue to see something I love that I didn’t see an hour before. I told Laurie I was going to make two of them. One using her fabric and the other using Ambleside by Brenda Riddle. So far I have the applique’ part completed for block 1. I hope she likes it. Looking forward to seeing your version. the concept seems so simple. you only have to make ONE block a month. who doesn’t have time to make ONE block a month? I mean, you even get the fabric to make that ONE block a month…. no need to search out for the perfect fabric, or make sure they look great together, you already have it. yet we all have those bom kits sitting in our stash. I even have a whole shelf for mine. I try to avoid them but sometimes there is that one quilt that you fall prey to. BTW: I was just notified that my austin bluebird kit arrived at the shop and I can go pick it up!!! LOL!!! I think starting the cutting the day the BOM arrives is a good idea. I’ve also found that giving yourself one week to make the block helps. If you have a whole month, it’s too easy to say “I’ve got plenty of time, it can wait until another day”, which doesn’t always come. Another advantage is that you then have 3 whole weeks to get excited about the next block. I laughingly call my set the BOM quilt kit “historian” because my BOM kits stay intact and could be placed in a time capsule … BUT … this year I’ve broken out of that pattern. I was 3-4 months behind in a BOM last fall. Went to a quilt retreat and took those kits. Cut and put them all together while on the retreat and since then whenever the most recent BOM arrives I try and cut it out within a day or so and LEAVE the pieces on my cutting board so that I can’t do anything else until I put them together. Currently working on the 2014 Designer BOM through The Fat Quarter Company. Each block is designed by a different well-known designer using Edyta Sitar (Laundry Basket) fabrics. It is going to be beautiful when finished. I think the Austin Bluebird project is AWESOME … I might have to check into that one. Good topic, Carrie … you’re doing a GREAT job at Moda!! I love Austin Bird and Laurie and Polly are so sweet and nice but, sorry, no appliqué for me. Perhaps one day in the future or if the next Minick & Simpson BOM will be just pieced. Now about BOMs: I only participate if it’s a free BOM because shpping is a killer and for a BOM it’ll be INSANE, like 300$ shipping (12 times about 25$ —> PSYCHO KILLER SHIPPING). I love the Aurifil BOM (did all the blocks from last year, no it’s not finished yet because I didn’t like the option so I need to come up with something else, but yeah, my mini quilt for January is already finished;-), I made one of Monique Blogger Girl’s quilt (not quilted yet, of course) and I’ve already made my Snapshot block (of course with other fabrics, see shipping). I have a love/hate relationship with BOM’s. I love having “fun” mail in my box but I hate how I procrastinate with them! Your hint on cutting them right out is a good idea and one I should follow! I’m actually doing the FQ Mystery BOM and just updated my blog with block #8, just in time too because I received notice that # 9 is coming later this week. This one is really the only BOM i’m involved in but truthfully, I have the FQ Shop BOM from 2008 made from the Three Sisters fabric all in a nice ziploc bag NEVER TOUCHED! I don’t know why but it’s on the 2015 list of projects to finish. The Austin Bluebird was a tempting BOM to join, and I actually did talk a friend into joining last week…..but I don’t do appliqué and I refuse to spend good money then have it sit undone. I’ll live vicariously thru all the IG girls that are doing it and showing pictures. LOVE reading your blog posts almost every morning…. I have participated in several BOMs and have two going right now. I find that it’s true that if you complete the block the minute it comes in the mail you have a greater chance of keeping up and finishing it in the end. I do have 2 or 3 right now that I didn’t keep up and there still sitting there waiting for me to finish them one of these days.